We are instrumental in offering our esteemed clients with Multi-Spindle Knurling machines that finds application in various industries. Our machines are highly praised for their features such as superior construction, strength and high efficiency. Moreover, these machines can be availed in various technical configurations as required by clients. Also, these are customized based on various parameters such as shape & form and are offered at reasonable prices. We are providing our clients with outstanding performing Knurling Machines Single Spindle to Eight Spindle, extensively used as slitting machine for aluminum and plastic caps with vertical axis. Moreover, these machines features safe and rational design, ease of operation, high efficiency and longer service life. Additionally, these machines are sophistically manufactured making use of advanced technology and machines. 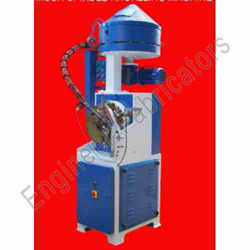 We offer these machines in various specifications as detailed by clients. Further, these machines are offered at very reasonable prices in market.